As we approach the festive season, remember to pay close attention to the dates inserted in agreements for the sale or purchase of immovable property. It is prudent to arrange that the due dates for payment of a deposit, obtaining bond approval and guarantees do not fall too close to public holidays as many people are on leave. 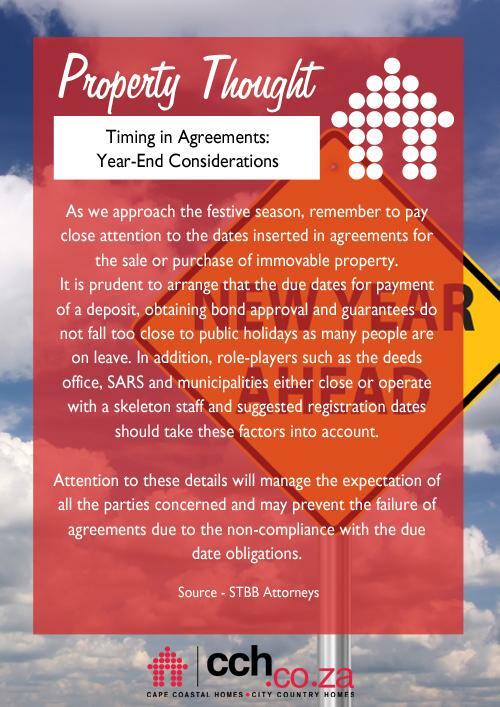 In addition, role-players such as the deeds office, SARS and municipalities either close or operate with a skeleton staff and suggested registration dates should take these factors into account. Attention to these details will manage the expectation of all the parties concerned and may prevent the failure of agreements due to the non-compliance with the due date obligations.